When I saw a recipe for Raisin and Rhubarb Pie in a hundred-year-old cookbook, I couldn’t get it out of my mind. Raisins and rhubarb, rhubarb and raisins. . . I knew that the alliteration was what drew me to the recipe . . .but, I kept thinking, what does this recipe taste like? Would I like it? So before I knew it, I was making a Raisin and Rhubarb Pie. I was rewarded with a lovely taste sensation. 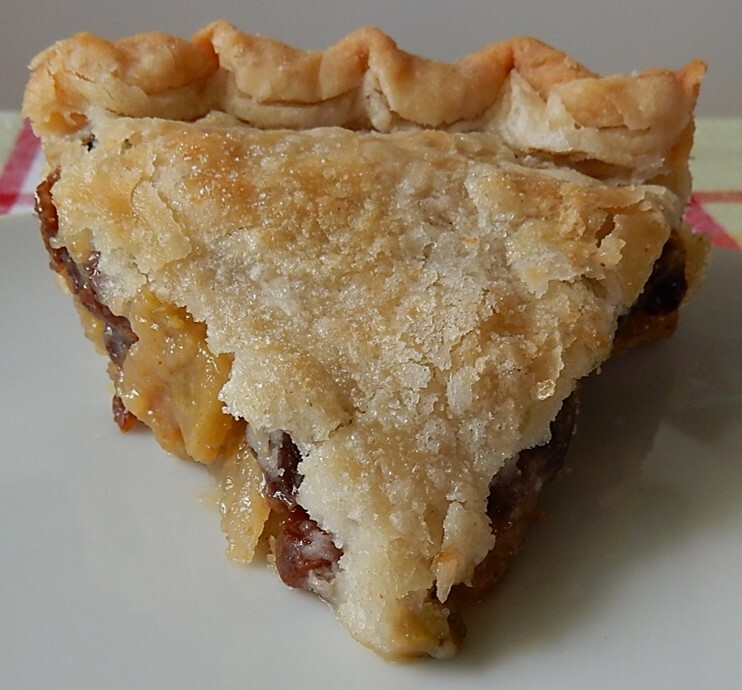 The sweetness of the raisins perfectly balanced the zesty rhubarb to create a scrupulous old-fashioned pie. Heat oven to 425° F. In a bowl put egg, sugar, salt, and flour; stir until mixed together. Add raisins and rhubarb, stir gently to combine. Turn into pastry-lined pie pan. Cover with top crust and flute edges. Brush crust with a small amount of milk; sprinkle with sugar. Bake in oven for 15 minutes; then reduce heat to 350° F. Bake an additional 20 to 30 minutes or until crust is lightly browned and juice just begins to bubble. Posted on May 7, 2017 May 7, 2017 by SherylPosted in FoodTagged pie, raisins, rhubarb. That does sound like an interesting taste combination! I like sour cream and raisin pie, and I alays add more raisins to purchased mincemeat, so I think this would be very good. In fact, it might suit rhubarb just as well as strawberries. If you like raisins in pies, you’ll love this recipe. This sounds good. But Larkin salt? It didn’t make it to your interpretation , so maybe it no longer exists? Not a fan of cooked raisins but I can see how they might pair nicely with rhubarb. You’re quite the adventurer! That sounds delicious but you can’t buy rhubarb in Florida. I may substitute something like mango. Years ago in New York State, we had a rhubarb patch outside of our house. We ate rhubarb all the time. Whew, I’m amazed that you can’t buy rhubarb in Florida. They still sell rhubarb in stores around here during the Spring – though I think that it’s availability might be for a shorter time period than it once was. It’s really strange how so many fruits and vegetables are now available year round – and other produce like rhubarb is much less available than it once was. I have never seen rhubarb. Maybe I will look again in the store but I have never encountered it in the frozen section or the fresh section. .
What a great combo. Rhubarb and strawberry work well together too. Shared this whole post with some of my friends. We have been talking about rhubarb so it’s very apropos . It’s wonderful to hear that my timing was good with this post. Mmmmm! Sounds and looks scrumptious. The raisins work really well in this recipe. I think that it would be fun to experiment with different ratios of raisins and rhubarb. Once again, your photographs make my mouth water. Love the addition of a sprinkle of sugar on the crust before baking. My husband loves strawberry and rhubarb pie so the variation with the raisins is one I will try. I almost always put sugar on the top of two-crust pies and couldn’t resist with this one even though it wasn’t in the original recipe. I think that you’ll enjoy this recipe. Similarly to strawberries, the raisins help cut the tartness of the rhubarb. This sounds like a one hundred year old recipe! You don’t find raisins in many pies any more. I definitely would try a slice, though. Raisins were much more popular a hundred hundred years ago than what they are now, but they are a nice additional to many recipes. This pie is definitely worth trying. Your pie looks like perfection. If we get rhubarb this year, I should bake this for John, who loves raisins. I’ll bet it would make him want two rhubarb pies a year rather than one. Your husband must be related to mine. 🙂 I made this pie – and it reminded him that he also really likes the Rhubarb Sponge Pie that I sometime make, so he asked when I was going to make that pie. Isn’t it wonderful to have a responsive audience? Oh yum! I’ll enjoy looking and imagining while I continue to avoid sugar. Looks and sounds delicious! I love rhubarb (when it’s available), so I may have to try this. By the way, my grandson loves the pork chops with dressing recipe you shared. It’s now in the family favorites file! Thank you so much for all these delicious and interesting recipes! It’s wonderful to hear that he liked with pork chops with dressing recipes. Thanks for letting me know. I’ve had strawberry-rhubarb pie and loved it, but I’ve never thought to combine raisins and rhubarb. Thanks for this recipe! Like you, until I saw this recipe, I never would have thought of combining raisins and rhubarb – but they work well together. Now that’s a wonderful idea! I’ll have to remember that come fall.. right now fresh fruit is handy..and I’ll have to order the rhubarb as we can’t grow it around here. I’ll let you know what my husband thinks because he is the taste tester in my house. It must pass his palate first. I like how you tweaked the recipe, and look forward to hearing whether your husband liked it. Readers always find it really useful to read about others experiences with these old recipes. so I’m going to blog on making this recipe. It was good, subtle sweetness to a regular rhubarb pie. I was disappointed that the filling didn’t bubble up very much while baking – through the crust vents. It was good. They must have had more abundance of raisins instead of strawberries and raspberries in 1917. Oh my goodness. It sounds so wonderful. Good thing it’s not right here where I’d have to resist the sugar in person. I had a hankering for raisin pie, and love this version, as the tart rhubarb and sweet raisins marry beautifully. And we have plenty of rhubarb here in Canada! Mine looked just like your picture – I made no substitutions but increased the rhubarb and would reduce the sugar somewhat. Thanks for taking a moment to let us know how the pie turned out. It wonderful to hear you enjoyed it, and other readers who make this pie will find your suggestions helpful.